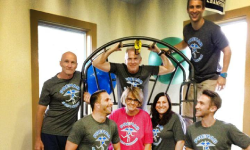 Prehab RI’s caring staff has been providing quality care to the residents of Rhode Island since 1988. Our primary goal is to improve your quality of life! Prehab RI draws from each of our physical therapist’s personal backgrounds to develop rehabilitation programs tailored to our patients' individual needs. We have experience treating patients of all ages and from all walks of life that suffer from athletic injuries, functional biomechanical faults, as well as pre/post operative care. We work to develop a treatment plan designed to help you feel your best - whether it's to return to the playing field, work, or life! At Prehab RI, You'll Limp In & Leap Out! It is regretful that injuries and illnesses occur - but in the hands of the Prehab team, your rehabilitation program will be a highly effective and enjoyable experience!